This wonderful, winter-flowering shrub produces fragrant, creamy-white flowers in mild spells between December and March on almost leafless branches. These are sometimes followed by dull-red berries, which may cause a mild stomach upset if ingested. The leaves, when they appear are a rich shade of green - usually flushed with a plush purple. This is a splendid, deciduous or semi-evergreen shrub, that will flower more profusely when trained against a sunny wall. Try to plant it close to an entrance or pathway so you can catch its lingering aroma each time you pass. I bought this as a source of forage for my bees in the winter months. It flowers endlessly and has the most amazing scent. A great grower. the shrub seems to be healthy but has not flowered this winter. i am hoping for next winter! Used it at the edge of a mixed border where I can smell it as scent wafts around the garden. Its a vigorous grower in the free draining soil I have and in competition with a large tree's roots. I do prune it every other year to keep it a suitable size for the space. Gets full south facing sun for part of the day, though this is shortened when the trees are in full leaf to about 4 hours. Have experimented with cuttings in quite a shaded woodlandish position (not deep shade but dappled, where it is difficult to grow many plants, the new plants are doing well and I now have first batch of flowers on a small plant from cutting taken around 3 years ago stuck into the soil and pretty much left to get on with it. Its a tough plant can take fairly dry conditions. The scent is beautiful and powerful now in Feb as there are masses of flowers on the well established mother plant, and I often see bees on it. It normally has just started flowering by Christmas and can cut a couple of stems for indoors, but Jan and Feb is when it comes in to its own. The plant arrived in excellent condition, was easy to plant and, so far, has remained in good health. As a winter flowering shrub I have still to see how it will look in flower and what kind of fragrance it will have. I have placed it close to my gate in the hope that its beauty and scent will lift my spirits as I walk in and out of the garden through the winter. 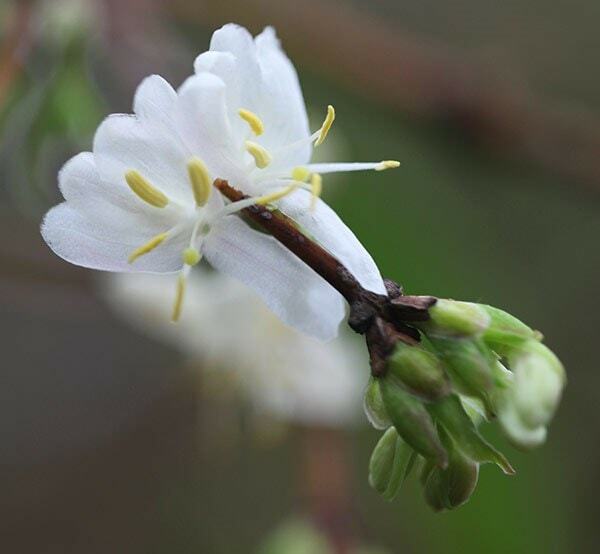 Is the Lonicera fragrantissima suitable to grow in a pot? I'm looking for a climbing plant (ideally scented), to grow against a fairly sunny SW facing wall by my back door. The area is paved, so it would need to be potted. Alternatively are there any clematis that don't mind being grown in a container? Is Lonicera fragrantissima suitable to use as a low hedge againsts a south facing low fence which is otherwise bare?